Say hello to Evans. Evans is from Kenya. 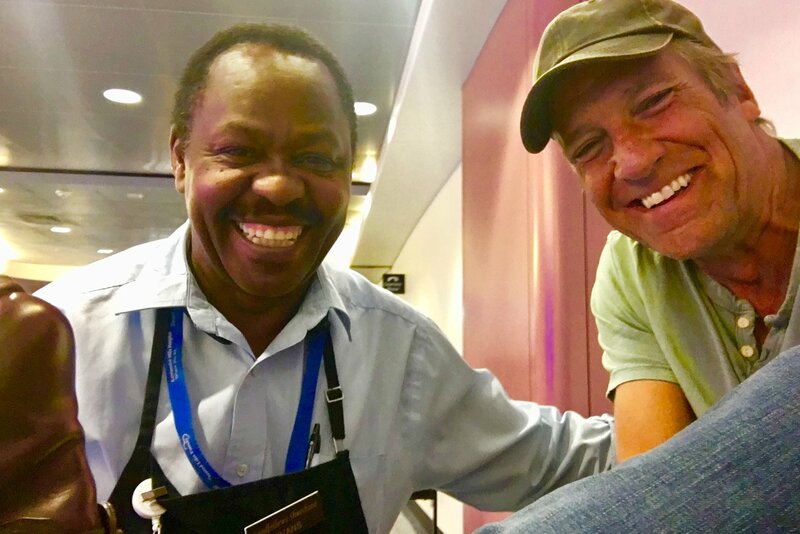 He came to America five years ago, and has been shining shoes ever since. Thousands and thousands of shoes. 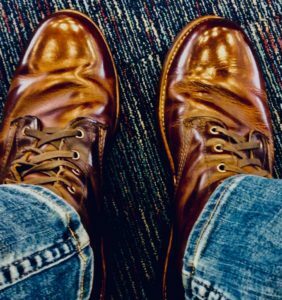 I got to know Evans this afternoon in the glamour of Terminal B, here at the fabulous McCarran Airport in beautiful Las Vegas, Nevada, where my dusty boots received a long overdue shine. During our time together, I learned many interesting things about Evans, but three qualities stood out. 1. Evans never stops working. 2. Evans never stops smiling. 3. Evans has no idea who I am. All of these things became evident when I ascended his lofty throne, where I remained on display for the better part of twenty minutes. As we began to chat, a woman walked over and asked me how my mother was doing. “Top of the world,” I said. When the woman left, Evans asked me if my mother was famous. “It’s important to honor our parents,” he said. Moments later, a man walked over and said my podcast reminded him of Paul Harvey. I thanked him, and we took a selfie. Another man had some questions about the most recent episode of Somebody’s Gotta Do It, which I answered. Then, a nice couple from Phoenix thanked me for doing Returning the Favor, and told me how the show had restored their faith in humanity. We took a photo as well. Through it all, Evans became more and more intrigued. Every time someone came over to say hello, he just smiled and shook his head. “You must be someone of great importance,” he said. I laughed and said that I was just a guy with dirty shoes who couldn’t hold a job. Right on cue, a couple of maintenance workers ran over and said Dirty Jobs was the best show they’d ever seen. The maintenance guys laughed and asked Evans if he’d take their photo with me. Evans asked me if that would be OK. I said sure. Over the next twenty minutes, a dozen or so people came over to chat while Evans made my shoes look brand new. Most of the people asked about Dirty Jobs, and when my shoes were finally transformed, I’d shared a few of my favorite stories with a small crowd. Evans wanted to know more about that show. His eyes lit up, and his smile grew even wider. I paid Evans for his excellent work, tipped him like a high roller, and made my Southwest flight to Kansas City with moments to spare. Your mission, Facebook, should you find yourself in the opulence of McCarran Airport with a few minutes to kill, is to stop by Terminal B and get your shoes shined. Ask for Evans. He’s the guy with a smile on his face. Show him these pictures, and tell him the Dirty Jobs Guy says hello.